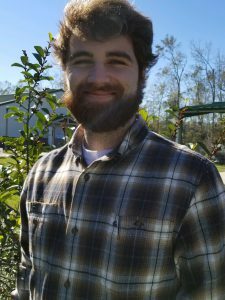 The University of Florida’s Jackson County Extension Service has a new Horticulture Agent, Logan Boatwright. His educational program will focus on commercial fruit crop, vegetable, landscape, turf, and specialty crop production. As the Horticulture Agent, Logan will provide assistance to producers through farm visits, workshops, field days, and on-farm demonstrations. He will also coordinate the Master Gardener Volunteers who provide educational training and individual help for home gardeners. Logan was raised on the Poarch Band of Creek Indians reservation in Atmore, Alabama. Auburn University is where he earned a Bachelor’s and Master’s Degree in Horticultural Sciences. He studied under Dr. Wheeler Foshee and Dr. Tyler Monday, who guided his research project, which evaluated the combinations of soil dimpling and mulch type to prevent nutsedge punctures in polyethylene mulched beds. Logan also has two years of experience working as a farmhand for the Southeast Kiwi Cooperative Inc. based in Reeltown, Alabama and as residential landscape worker for Auburn University. If you have questions about commercial production of fruits, vegetables, turf, or landscaping, Logan can be contacted at the Jackson County Extension Office. For questions regarding home gardening or landscaping, please contact the Master Gardener Volunteers. Contact the Extension Service from 7:30 AM to 4:30 PM weekdays by visiting the office, located at 2741 Penn Avenue, Suite 3, Marianna, by phone at 850-482-9620, or 24 hours a day through their website https://sfyl.ifas.ufl.edu/jackson/. The farm Bill is about to pass which means Hemp will become legal to grow. Hemp is a huge cash crop and from what I have been reading not hard to grow. Can you have a class on growing hemp? UF/IFAS has research planned to grow hemp in spring 2019 with a possible field day in the fall. My name is Lyla and I was wondering what the outlook is for horticulture jobs in Jackson county within the next few years. I currently go to USF, however they do not offer horticulture options and was planning on transferring eventually. Just wondering what types of horticulture jobs may be up and coming? Thank you so much!! Hi Lyla, I’m thrilled you are interested in horticulture! You are not limited. This area of agriculture has a variety of career paths to choose from! One can choose to work in production such as operating a greenhouse, landscaping service, vegetable farming, or orchard production. Others may choose landscape design and maintenance, or marketing of horticultural products. Then you have applied research to help further our knowledge of plants and pests, teaching, crop inspection, and many more fields. There is a continuous growing demand of horticulture services. However, increasing agriculture mechanization and efficiency of managing a farm means that there will probably be less need for workers to complete tasks that machines can do. Do not let that discourage you from majoring in horticulture. As far as jobs in Jackson County, I am not 100% sure. Hurricane Michael caused very significant damage to many businesses. Only time will tell how those businesses faired. I hope my answer was helpful! Please ask anymore questions that come to mind or stop by the UF/IFAS Jackson County Extension office on 2741 Penn. Ave. You can reach us at 850-482-9620.